A few tree frogs have been utilizing the dogs’ water dish by day, protected by the metal hood over the plastic float that regulates the flow of water that Robbin has had to remove because the weight of three or four frogs opens the valve and overflows the dish on to the deck. We’re trying to talk, our conversation rudely interrupted by poorly punctuated, air-cracking croaks from the dish. Robbin gets up to inspect the source to see the frog’s vocal throat sac inflated. Then slips off on a humorously detailed rant about maleness. Catching the inflated vocal sac in a photograph is tricky in low light, finding an f-stop to allow auto-focus between croaks when you can barely see the tree frog and hold the camera still takes lots of shots. Furthermore, the photographer must keep his distance or the subject goes quiet with stage fright. And what else could we expect this close to the vernal equinox, the night before the full worm moon, buckeyes dressing leaves, redbuds about to bloom, finches assessing last year’s nests—it’s damn-near spring! 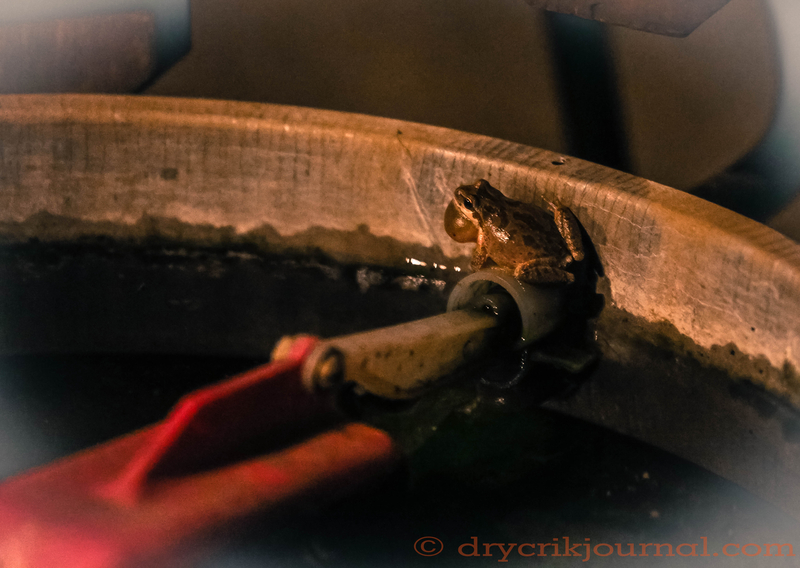 This entry was posted in Photographs, Ranch Journal and tagged Home, photography, tree frog. Bookmark the permalink. A VERY cool image John! Sounds like a wonderful way to end a day, John. Love to watch quail. Nicely written. I’ve noticed.noticed that the weeks seem to have become shorter. I keep waiting for an announcement that the earth is spinning faster. There must be a reason.